It defied all odds to become the most unexpected and acclaimed cult hit of the '80s, and it remains one of the most slyly subversive and thrillingly original action/comedy/drama motion pictures of all time. The legendary Peter O'Toole - in his iconic Oscar® nominated performance - stars as director Eli Cross, a deliciously megalomaniacal madman commanding a film-set circus where a paranoid young veteran (Steve Railsback) finds himself maybe replacing a dead stunt man, possibly falling for the beautiful leading lady (Barbara Hershey), and discovering that love, death and the mayhem of moviemaking can definitely be the wildest illusions of all. The Stunt Man now features a stunning HD transfer supervised by Oscar® nominated producer/director Richard Rush, plus new interviews and commentaries with Rush, Peter O'Toole, Steve Railsback and Alex Rocco, all in the ultimate edition of the classic that the Los Angeles Times calls "as innovative today as Citizen Kane was in its time!" At their core, even when their goals are to illuminate truth, all films are lies. Mere spectacles of light and shadow dancing across flickering screens, movies are pure manipulation and trickery. At their most frenzied and creative, some films can become almost like a circus act, a sort of figurative merry-go-round of reality and illusion, dancing hand in hand in a perpetually twirling celebration of fact and fantasy. 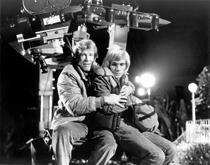 Richard Rush's 1980 film 'The Stunt Man' attempts to be such a movie. With an almost Felliniesque visual style and pace, Rush mostly succeeds, with an entertaining and at times stimulating picture, though there are some stumbles along the way. Stories about moviemaking are common place in cinema. From Truffaut's 'Day For Night' to Fellini's '8 1/2,' many masters of the craft have all taken their own shot at the concept. 'The Stunt Man' continues in a similar vein as those earlier (and far superior) efforts. The plot follows a fugitive on the run named Cameron (Steve Railsback) as he ends up hiding from the law under the guise of a dead stunt man working for an eccentric and egomaniacal director, Eli Cross (Peter O'Toole). While working on the film he falls in love with the movie's female star (Barbara Hershey) and becomes convinced that Cross is planning to kill him in the picture's climactic stunt in order to achieve a moment of true reality on screen. Based on a novel of the same name, the script is actually rather strong, and features some well developed characters and thematically rich material. Frequent parallels and metaphors are drawn between art and illusion and the film within a film and the actual movie itself. O'Toole's character in particular is rather impressive, spouting many lines of memorable, quotable dialogue. The acclaimed thespian's performance is also scene stealing, and his Academy Award nominated work here truly carries the picture, playing the character with a perfect blend of eccentric genius, and ambiguous menace. Barbara Hershey is also excellent as the leading lady caught between her director and newfound romance. As the stunt man himself, Steve Railsback is also good, though his performance can be a bit erratic. Even when relaxed, there is a certain level of madness in his eyes and he tends to go over the top quite a bit. This isn't necessarily a poor choice though, as the film's strange blend of drama, humor, action, and satire seems to call for an unhinged, paranoid, and slightly insane take. Bolstering the manic and whirling tone of the script, is an equally exciting and twisting cinematic style brought to the screen by director Richard Rush. Responsible for a mostly unimpressive filmography, 'The Stunt Man' was his only real critical success, and while a bit overrated in its time, it does deserve some recognition. Rush handles the frequent tonal shifts relatively well and injects the stunt sequences with a wonderful level of cinematic magic and deception, keeping the audience on their toes and playing with their perception of events. In these exciting sequences it is often hard for us (and Cameron) to tell what is real within the movie itself and what is merely part of the stunt. Other visual touches, like O'Toole's fantastic director's crane that allows him to hover around the set like some literal god, is beautifully realized and makes for a wonderful and thematically deep image. While praiseworthy on several fronts, the film is not without its faults. Certain aspects of the production have not aged particularly well, and some scenes which are seemingly meant to be taken seriously do come across as fairly cheesy. Of course, with a tone as wild and hard to pin down as this, it's sometimes hard to really judge what's meant to play straight. The scene in which we finally learn what Cameron did to be on the run from the law is a perfect example of both the strengths and weaknesses of this approach, fluctuating between over the top and somewhat laughable drama, and actually intentional comedy. Also, the pacing of the film suffers quite a bit in its second half as the more frenzied rhythm slows down to focus on romance. While these scenes are decent enough, they do tend to drag and again hold some slightly melodramatic performances. While not quite the celebrated touchstone of new American Cinema it was made out to be by some critics upon its release, 'The Stunt Man' still holds up pretty well. Its fun mixture of tones and genres are both entertaining and at times off-putting. Still, the good does outweigh the bad, and though Rush's film might not reach the same heights as other movies about moviemaking, it does offer some interesting and fun little observations as filtered through a frantic and paranoid lens. 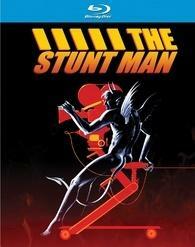 'The Stunt Man' is presented in a 1080p/AVC transfer in the 1.85:1 aspect ratio. Supervised by the director, this new transfer seems to accurately represent the film well. The print is in decent shape, but it does show some specks and other signs of age throughout. A sometimes heavy but natural layer of grain is also frequently visible, especially in the opening sequence. Detail is fairly good considering the movie's low budget roots, and while not overly impressive, several scenes do exhibit a nice level of depth. Contrast is strong and black levels are usually nice and deep, though they can appear slightly crushed and conversely elevated in a few nighttime scenes. Colors are good but not especially vibrant and seem to adhere to the intended look of the movie. This is a nice transfer that respects the original slightly gritty and raw look of the picture with a richly textured filmic quality. While not as clean and pristine as newer releases, this is still a solid video presentation. Audio is provided in an English DTS-HD Master Audio 5.1 and an English Dolby Digital 2.0 track with no subtitle options. Like the video, the audio is solid but not stellar. Dialogue is clean and exhibits a nice depth and fullness. Directionality is good, and while mostly front loaded, rears do get some nice use during the action sequences. Imaging is also fairly well done for a remixed surround track, though some choices can seem a bit unnatural. Dynamic range and bass activity are both good, though not standouts. Balance between all the elements is also well handled, placing the appropriate emphasis on dialogue, effects, and Dominic Frontiere's fantastic score. This is a pretty well done 5.1 mix that seems to respectfully open up the source material without going overboard. The inclusion of the original stereo mix is also a welcomed addition. Severin has included a strong assortment of supplements here including an audio commentary, a feature length documentary, and several featurettes. Unfortunately though, a lot of the same information is repeated throughout diminishing the value. All of the supplements are presented in 1080p with Dolby Digital stereo tracks and no subtitles unless noted otherwise. Audio Commentary with Richard Rush, Peter O'Toole, Steve Railsback, Barbara Hershey, Alex Rocco, Sharon Farrell, and Chuck Bail - This commentary gets off to a rocky start with director Richard Rush basically reading quotes from good reviews of the film and pieces of his own self-serving over analysis of the major themes and deeper meaning of the story. Fortunately though, Rush eases up on the pretentious self gratification and once other participants start to chime in, the track finds a nice groove. The material seems to be a combination of recordings made with some of the participants together and separately. As expected, the sections which feature the talent together play the best as the group seems to be quite friendly with one another and they share nice chemistry. Though some information and stories are repeated in the other various featurettes, a lot of the information provided here is unique to the commentary and includes some entertaining anecdotes and trivia on the production and dangerous stunts. Despite the annoying segments of Rush analyzing his own film, this is a strong track that fans of the movie should enjoy. The Sinister Saga of Making The Stunt Man (HD, 2 hr) - Forget the main feature, this is the real masterpiece. Presented in upscaled 1080i, this vintage making of documentary is an often bizarre look at the troubled production history of the film. Filled with incredibly cheesy and dated editing transitions, effects, and chroma key work (apparently shot in 2000, it actually looks like it was made at least a decade earlier) the majority of this doc features director Richard Rush spoon feeding the themes and meaning of his movie while engaging in an assortment of unrelated activities, like flying an airplane, speaking to a clone of himself, riding an elevator up and down, running around an indoor track, and eating a Caesar salad while sitting on the floor under a table. So in other words, this is pure genius. In between all these strange shenanigans are some actually worthwhile insights on the entire difficult process of getting the film made and eventually distributed, including interviews with the cast and crew. Despite its eccentricities, this is a pretty comprehensive doc, though Rush's endless stories can get a bit tedious toward the end. The Maverick Career of Richard Rush (HD, 34 min) - This is a recently conducted interview with Rush as he discusses his entire filmography with clips from his movies cut in between. Unfortunately, most of the information relating to 'The Stunt Man' was already covered in the previous feature. Still, fans of the director may find the information on his previous efforts of interest. Peter O'Toole Recounts The Stunt Man (HD, 19 min) - This is exactly what it sounds like, and features a recently conducted interview with the actor about this film. Most of the info here is repeated, but O'Toole does share a few new bits and seems to be really fond of the picture and his experience on it. Devil's Squadron - Exclusive New Featurette with Steve Railsback &Alex Rocco (HD, 19 min) - The two actors from the film sit down for this recent interview to recount their experiences on the movie. The most entertaining aspect about this feature comes from the fact that Railsback and Rocco are apparently best friends, and their still going strong bromance shines through as they compliment and make fun of each other. While again, most of information is repeated from the commentary and doc, there are some new bits peppered throughout. Barbara Hershey on Nina Franklin (HD, 14 min) - Here actress Barbara Hershey reflects on her role in the film. Unfortunately, almost all of this information was already covered, in some cases word for word. Deleted Scenes (HD) - Two deleted scenes are presented here, Sand Pile and Police Station. The first scene features a fairly interesting exchange between O'Toole and the screenwriter character lamenting about their film within a film's outdated subject matter. The second scene is a truly strange and over the top sequence which sees O'Toole and company pick up his leading man from jail. Trailers (HD) - The film's teaser, theatrical, and Spanish language trailer are included. In the end, 'The Stunt Man' is a fairly entertaining examination of perception and paranoia. While it's not quite the classic some make it out to be, it's still worth a look. The video and audio both seem to respect the source material well, and while there is a lot of repeated material, the supplements do offer a comprehensive but redundant look at the film. This is a solid disc.